OK, I didn’t have particularly high hopes for this show coming into it. I knew it was based around the same story as the movie released in 2012 which featured Tom Cruise in his first musical, and I knew that particular movie didn’t garner any Oscar attention, but on the bright side Stage West always has great food and it’s a fun night out. So fast forward to the end and my wife tells me out of the many shows we’ve seen this was her favourite!! And while perhaps not my favourite, it was in the top three, so what happened? This particular story is one we see time after time in movies and shows. Boy meets girl, boy loses girl, boy tries to get girl back. It’s a timeless story because the viewing audience gets drawn into the story and typically starts to cheer (it least internally) for the obvious couple to get together. The keys to making this work are we have to actually like the characters and the story has to make sense and in this performance it worked with both elements. 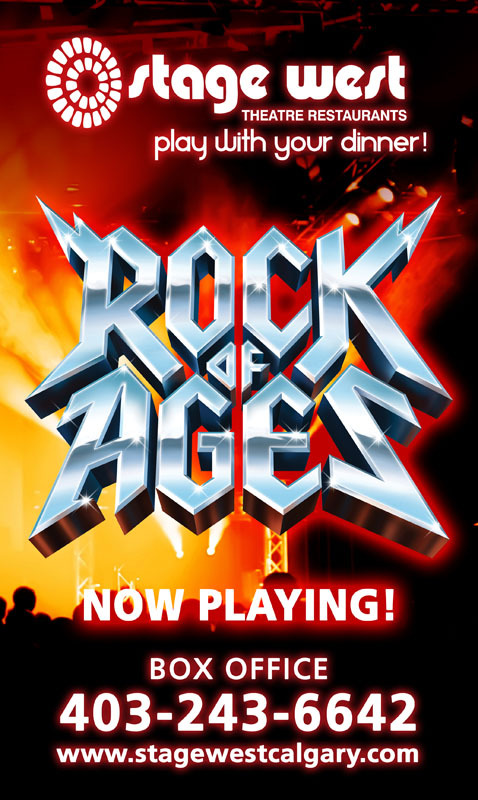 Throw in several scene stealing performances by some of the other characters and Rock of Ages truly became a fun and enjoyable show. Initially it started slow and I wasn’t very impressed with the vocal performances of the two main characters, but as we moved through the performance their singing and presence became stronger and stronger. During the intermission this came up in conversation with our dinner companions and we realized the weaker initial performances were part of the growth of the characters from their timid initial introduction to their eventual stronger characters as the show progressed. By the second act they were both belting out their vocals and both demonstrated a strong stage presence. Of course the lead roles can’t typically carry a show by themselves without a little assistance and in this case they had plenty of assistance. From the narrator Lonnie to the bar owner Dennis to the villains Franz and Hertz everyone brought their A-game to the show and made for a night with a ton of laughter form he audience and a roaring appreciation from the crowd at the end. While it was a musical there were many comedic events throughout and all together it was a great balance. Throw in many classic songs which will be very familiar to anyone growing up through the 80’s and it made for a great evening.